Tilt bins are space-saving storage units designed to keep stored items highly visible and easy to find. We offer versatile and flexible bins which are perfect for keeping small components, equipment, and parts sorted, organised and easy to identify. The bins tilt out smoothly at an angle and open independently while still secure. They can also be removed altogether during cleaning. The optional locking bar that comes with this system allows the bins to close securely for in case of movement. Tilt bins are usable on a desk / workbench by mounting to steel rails or louvered panels. They can also be mounted on a wall, stacked or used individually. Available in different colours and sizes, these bins are used for residential, commercial or industrial storage. They come with card stock labels for easier identification and retrieval of items especially in storage facilities with various storage units for different products. Transparent tilt bins are suitable for environments where quick access is of paramount importance. 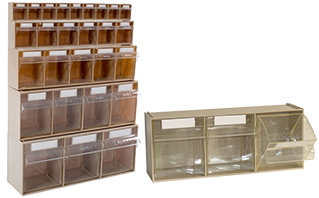 There is a wide variety of racks that are available for the easier shelving of tilt bins and which facilitate efficient use of space. They are suitable for all applications and are frequently used for storage of small parts in vans, shops, factories, warehouses, storerooms, and garages.